10 Ways to Embrace Player Devel. | White Plains Lacrosse Association Inc.
I’ve been all over the place with coaching—from preschool learn-to-play to high school and college lacrosse—and the underlying theme is the same: Players who have strong fundamentals can be more easily taught strategy and higher-level skills. The players who struggle are the ones that are missing the foundation they didn’t get at the younger levels. When coaching middle school and youth lacrosse, it’s fun to throw a play in here and there, and to work on strategies at practice. But when the majority of practice time is spent on these items instead of the basics, the players of that championship middle school team are going to lose out in the long run. If we put these two players here and get the ball to our fastest middie, then get the weak catchers to stand over there…Aha, we’ll score every time! What if we plant two defenders right at the top of the 8-meter and they never move. It stops the fast break! If we pass less and run more, then we have less chance of dropping the ball and we score more. Our team is undefeated. We must be great coaches! At the end of the season, all we really have are players whose fundamental skills have not really improved. Their understanding of the game is not much better, and they rely on scripted plays that will be completely different next season with the next coach. We still get players coming out for the varsity squad, in their fourth or fifth year, who can’t catch a ball and run at the same time. Or, who ask what shooting space is. Really? Give me a player that has great ball handling from seasons of focusing on ball touches, understanding of basic defensive and offensive concepts, repeated opportunities to fail and learn on the field, and lots of encouraged passing during games, and they can be developed and transitioned into a higher-level player quickly at the varsity and even college level. Even the best-intentioned coaches can get caught up in the scoreboard as confirmation of a job well done. Here are 10 easy ways to embrace player development and keep the focus on what players need to develop over the long run. My favorite recipe is groups of three. Any ball-handling drill can be broken down into tiny groups where each player gets ball handling, has less time to be distracted and coaches can walk around and attend to each group. It also makes for lots of groups and helps coaches avoid over-coaching. Let them drop it and figure it out themselves a few times. There should be lots of drills going on without any sticks at all. Positioning has to do with feet. Cutting equals feet, defense equals feet, picks equal feet, motion...feet. Notice the theme here? Use a playground ball instead of a lacrosse ball so the focus is on footwork and players with different stick skills get on the same level. Do it alone, do it with a friend, do it with a competitor, do it in a small-game scenario. For example, instead of just having your players pass the ball back and forth, work on catching by throwing the ball up and trying to catch it by the shoulder, then pass with a partner, then pass with a partner while another player is running on to try to intercept, then pass on the run with defense at chase. 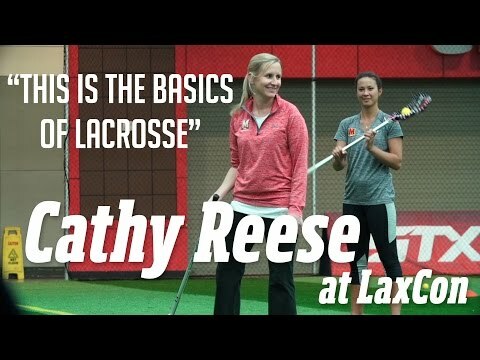 Here's a great stick work progression from University of Maryland women's coach Cathy Reese, presented at the 2015 US Lacrosse Convention. More specifically, help your players understand situational play. Call fouls out in drills or set up a fake foul. Explain and demo it the rule and the foul. Then, set it up and let them play it out. For example, on the girls’ side, set up an 8-meter shot and show how to clear the arc properly, how to take the shot and how to defend it, as well as instruction for the goalie. On the boys’ side, send a player off for an illegal faceoff and set up the fast break to work on defensive transition. End every shot with a goalie clear, make your attackers ride, make your defenders keep cutting, have them switch around positions so they understand the whole field. Use a playground ball and let everyone try being in the goal and directing their defense and watching their offense. Anytime you can get the players running around and moving their stick with a ball in it, you are doing them a huge favor. Whether it’s 1-on-1 inside a box just trying to protect the ball for 60 seconds or a giant game of tag inside the circle with each player trying to protect their ball, protecting the ball and being able to move around without losing it is going to build you a better team. Think they like a challenge? Have them do the drills with the ball in the back of the stick. If it takes more than three sentences, it’s too long. If they have been standing without moving for more than a minute, it’s too long. Another downfall of teaching sets and plays is that explaining then takes too long and usually involves lots of players standing around, so it’s counterproductive to the goal of developing their skills. Teach things in small pieces. Set up stations and have everyone learn every piece of the skill, start putting pieces together and keep adding until it’s complete. If you have a line of kids waiting, have them do an alternate station of ground balls or another skill and then rotate them in. It would be great if they stood by and watched and listened intently so they would know what to do when they go in. But let’s be realistic: They are more likely to be twirling their stick, staring at the sky or rolling around on the ground. If your players are constantly moving, getting lots of ball touches, and being presented with new information, then they need a mental and hydration break between skills. A short time to blow off some silliness and spit water at each other can go a long way. Physiologically, kids under 18 don’t sweat properly and regulate temperature quite yet, so that water is important, even when it’s not hot outside. If you notice you are shouting a play-by-play of non-stop instructions, then your practice plan may need to be tweaked. If they are getting a solid understanding of the game during drills at practice, then game day is like a performance; it’s time for them to try out what they can do and show off their blossoming skills to mom and dad! Grab a notebook and take notes of things they need to work on instead. After the game, you’ll have an ideal list of what to do at the next practice. The temptation to script everything and focus more on having a winning season is a struggle for every coach. Emphasize long-term athlete development and your players will thank you for years to come. And if you have extra time left, go ahead and try out that fun new play!